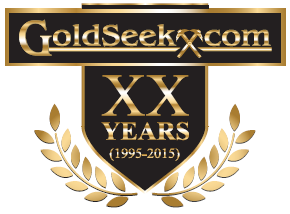 The latest 1-year chart for gold is � or should be � alarming for those still long the sector. It shows gold churning having hit a target after a parabolic slingshot move that resulted in it becoming heavily overbought. Now it is vulnerable to a reaction which the latest COTs suggest will be heavy. 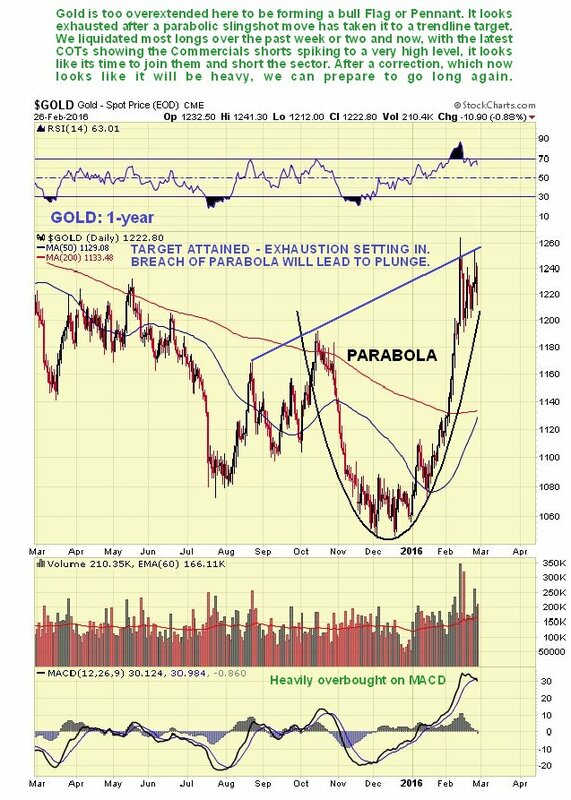 Breakdown from the parabola will likely lead to a dramatic plunge. 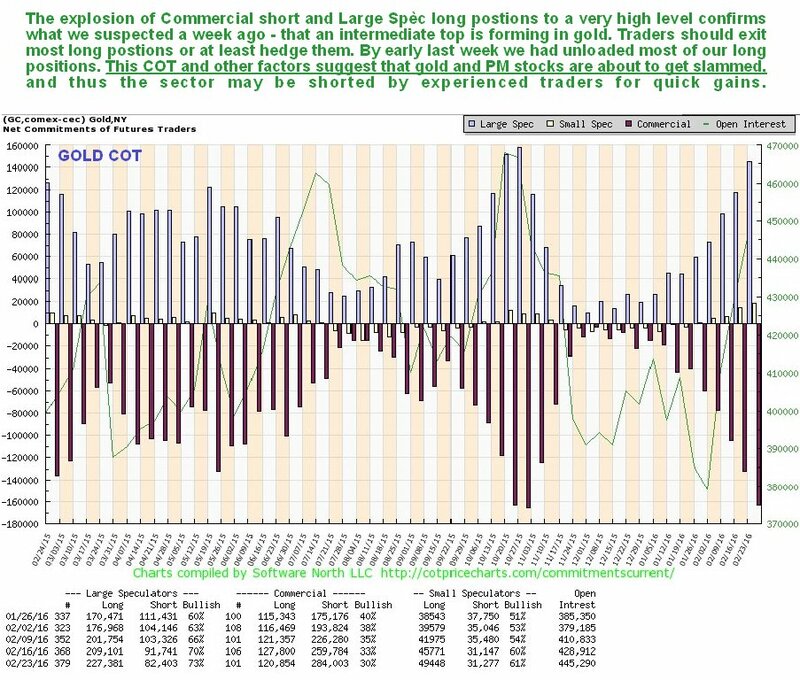 The latest gold COT chart, which may be directly compared to the 1-year gold chart above, because it also goes back a year, shows that Commercial short and Large Spec long positions exploded higher last week, the culmination of a multi-week exponential ramp. As the Commercials are collectively always right and the Large Specs wrong, this means trouble. This is characteristic of an important top, and gold is now expected to plunge, probably immediately. The long-term 6-year chart provides additional clues regarding why gold�s sharp advance halted when it did � it had arrived at the upper boundary of the broad downtrend channel shown. 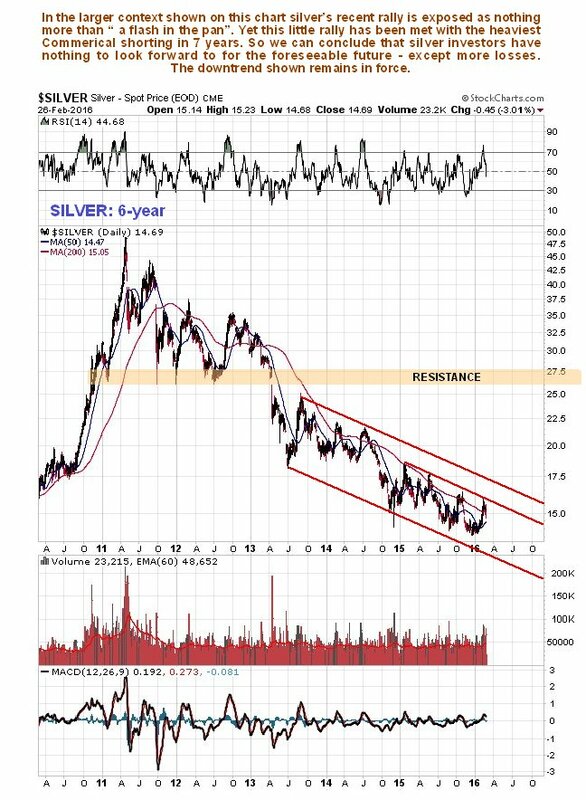 Turning to silver, the picture is considerably weaker, and is in fact dismal, although longer-term this should not be a cause for depression, as silver is normally weak compared to gold at this stage of the cycle. 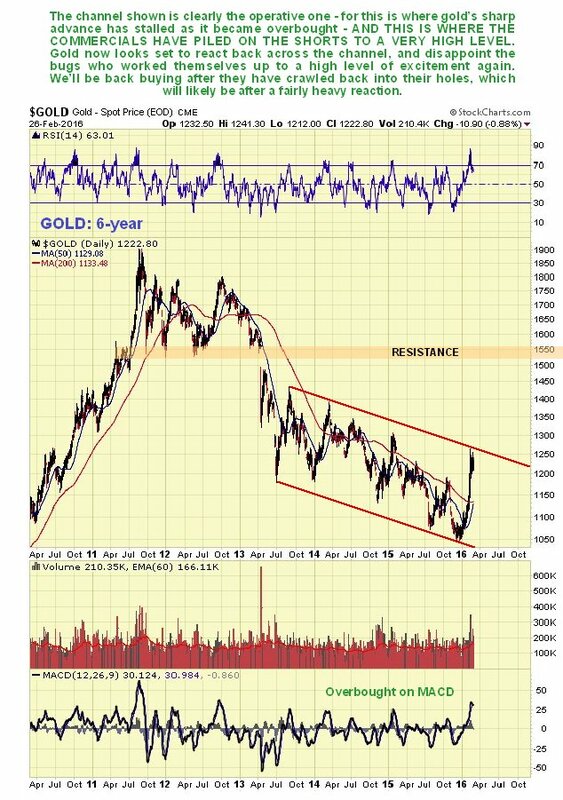 On its 1-year chart we can see that the recent rally was weak compared to the rally in gold - it did not even manage to rise much above its 200-day moving average, which did not turn up, and it failed to break out of the downtrend channel shown. Now it is breaking lower again, and latest COTs, which we will come to in a moment suggest that the reaction now starting will be severe, and take it to the lower boundary of the channel as a minimum downside objective. 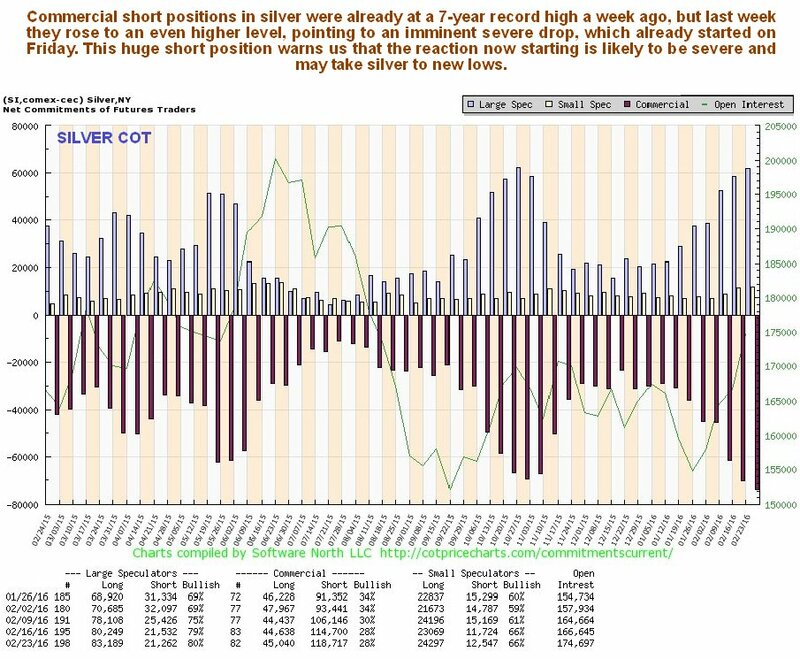 The latest silver COTs are simply frightful, with the Commercials having built up a 7-year record short position. This was already the case last week, and this week it�s even worse. 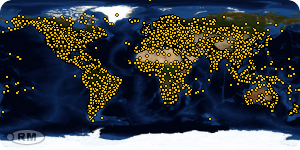 These COTs suggest that silver is about to take a severe beating. 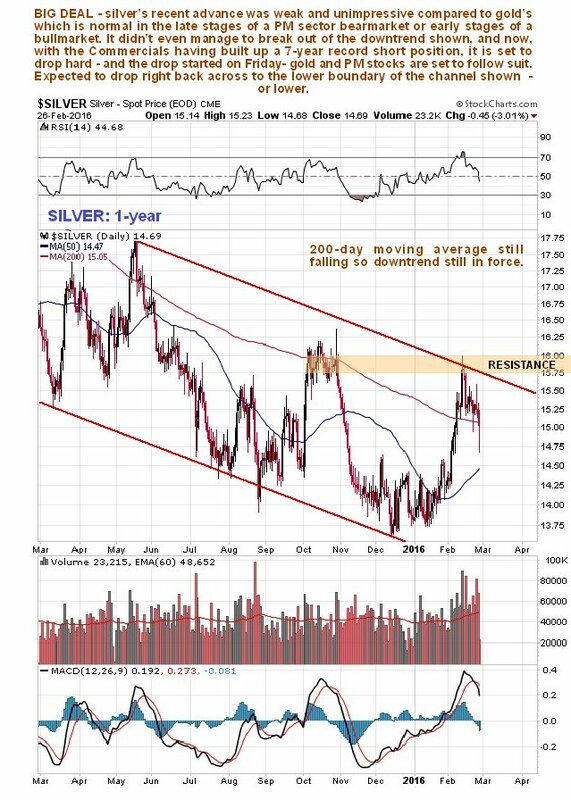 The long-term 6-year chart reveals that silver�s latest rally was in the end nothing more than �a flash in the pan� within its ongoing long-term downtrend, and the latest COTs point to new lows for silver soon. Trying to unearth a fundamental explanation or reasons for what we are observing here is, as usual, a waste of time. Normally, by the time you find out, it�s too late to do anything about it. Asked to speculate about possible explanations two things come to mind � the possible emergence soon of a coordinated global QE barrage that results in a Happy Days are here again mentality, as systemic stress eases for a while and the stockmarket rallies on the prospect of improved liquidity, which is what we have already observed as likely in yesterday�s update on the site Broad Market update � Belay that Shorting Plan, and a realization by the �mad as hatters� Neocons, who are possessed by a drive to overpower Russia then China and take over the world, that starting a thermonuclear exchange with Russia over Syria is perhaps not such a good idea, since the Nuclear Winter that might result would probably affect them too. There is a tentative ceasefire in Syria at present, and hopefully the tensions will ease somewhat, which would of course be a negative for gold and silver.